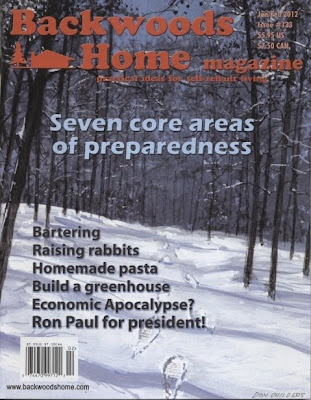 I had a recent article in Backwoods Home Magazine called The Seven Core Areas of Preparedness. 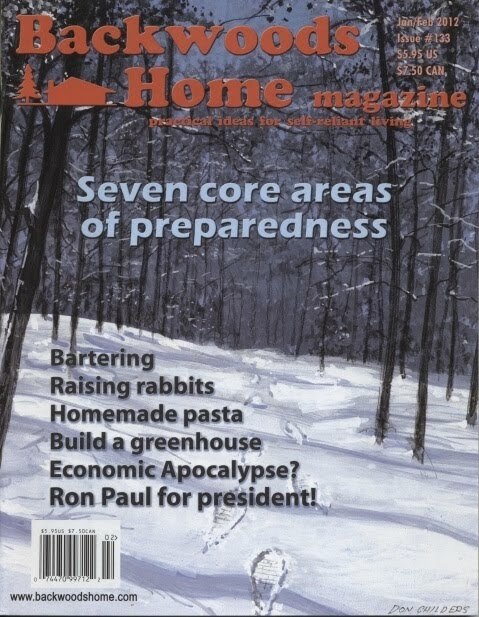 It got featured on the front cover! The funny thing is, I've gotten more emails off this article than I've had from any magazine article in a long time. Go figure. A reader named David even posted a short review on his blog. But, but Patrice, pasta doesn't get made! It grows on trees, is picked by swarthy rural Italian types, is dried, packaged and sold in supermarkets. Congratulations! I'll need to get that issue so I can read your article. I'm a new reader to your blog but I've loved what it so far. I had recently just moved from CDA so was curious what area you live.